The Quarry Supply Division at Van Keppel is an aftermarket products group that serves the Aggregate and Construction markets throughout the states of Arkansas, Illinois, Iowa, Kansas, Missouri, Texas, NW Kentucky, Oklahoma, Wisconsin, and Nebraska. Our goal is to partner with customers to provide the highest quality products at competitive prices. We strive to be an integral part of assisting our customers in lowering their operating costs while increasing production with the various product lines we represent. Conveyor belt controls and cleaners, motion controls, and aerators. Head Protection, Hearing Protection, Disposable Respiratory Protection, Squincher, Eye Protection, Gloves, Cleaners, Vests and many more. High Test Tow & Binder Chains, Proof Coil Tow Chains, General Purpose Tow Chains, Log Chains, Load Binders, Wire Rope Slings, Steel Swage, Mechanical Splice, Flemish Eye and much more. 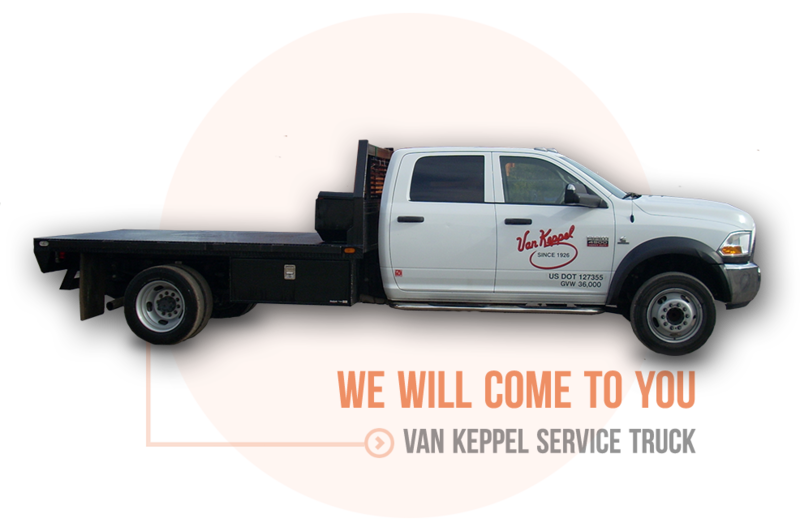 We at the Van Keppel strive to offer the best service possible. All of our products are available to be delivered locally or statewide. Our salesmen drive flatbed trucks or have pick-ups with trailers to assist with their delivery. We are proud to meet your needs when it comes to delivering your Quarry Supply needs. We appreciate the opportunity to partner with you and your company.